Most people don’t keep their New Year’s resolutions. According to a commonly cited statistic, 92 percent of resolution-makers become resolution-breakers. The odds may not be ever in your favor, it seems. Of course, most people don’t accomplish their goals, period. It doesn’t matter to your body whether you resolve to eat right and exercise on January 1 or July 17, for example. The only thing that matters is whether you eat right and exercise. You can start doing those things — or not doing them — any time of the year. The same goes with any other goal. The problem is that perfectionism magnifies your mistakes and minimizes your progress. It does not believe in incremental success. Perfectionism portrays your goal as a house of cards. If one thing doesn’t go perfectly, the whole thing falls apart. The smallest misstep means the entire goal is ruined. Perfectionism also messes us up by making us aim too high. There are perhaps a thousand reasons 92 percent of resolutions fail, but one of the greatest is also one of the most deceptive. When we create a goal, we aim for something better. We want to look better. We want to feel better. We want to be better. But then better turns into best. We don’t want small growth. We want massive, overnight success. Cut your goal in half. Make it fun if you want it done. Leave your hiding places and ignore noble obstacles. Get rid of your secret rules. Use data to celebrate your imperfect progress. Again, this looks easy, but while Acuff keeps the tone of the book light — he’s a very witty author — there are sound motivational principles behind his advice. And he fleshes out how to take each action step with concrete examples, diagnostic questions and helpful suggestions. Reading a book isn’t a magic wand. Accomplishing your goals requires work, often hard work. But the work doesn’t have to be impossible or joyless. In fact, it should be doable and tap into your deepest hopes. As the New Year begins, don’t let the best get in the way of the better. Don’t let perfectionism hinder progress, however small. Be realistic, be patient…and get ’er done! Jon Acuff, Finish: Give Yourself the Gift of Done (New York: Portfolio, 2017). 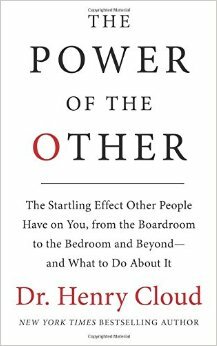 Henry Cloud, The Power of the Other: The Startling Effect Other People Have on You, from the Boardroom to the Bedroom and Beyond—and What to Do About It (New York: Harper Business, 2016). Leaders often say, “It’s lonely at the top.” That’s true, of course—at least to an extent—but it’s also tragic. Leadership doesn’t have to be lonely. In fact, as Dr. Henry Cloud argues in The Power of the Other, success depends on relationship. “The undeniable reality,” he writes, “is that how well you do in life and in business depends not only on what you do and how you do it, your skills and competencies, but also on who is doing it with you or to you” (emphasis in original). In Corner Two relationships, leaders have “a bad connection.” They experience a “connection, preoccupation, or pull toward a person who has the effect of making you feel bad or ‘not good enough’ in some way” (emphasis in original). Think of a son trying to gain the respect of a hypercritical dad or an employee trying to please a boss who rarely praises employees. In contemporary parlance, authenticity is often interpreted in non-relational terms. “I gotta be me!” people exclaim. The problem is that this understanding of authenticity is individualistic, not relational. “I gotta be me” is often used to slough off or criticize the counsel others are trying to give us. That’s not what Corner Four looks like. When we truly connect with others, they help us draw out the full potential of who we really are and what we can truly be. Relationship makes authenticity possible. To be one’s true self, to reach one’s full potential—whether as a leader, a spouse, a parent, or whatever—you and I need others. Authenticity requires relationship. That’s what The Power of the Other is all about. I recommend the book highly. Angela Duckworth, Grit: The Power of Passion and Perseverance (New York: Scribner, 2016). Every year, approximately 14,000 high school juniors apply to the United States Military Academy at West Point. Of these, about 4,000 secure the necessary nomination from a member of the U.S. House of Representatives or Senate or from the vice president. Of these, around 2,500 meet West Point’s standards for academics and physical fitness. Of these, only 1,200 are granted admission. And among these, approximately 20 percent drop out before graduation. In other words, only 7 percent of high school juniors who apply to West Point actually graduate from it. Angela Duckworth cites these statistics at the outset of Grit in order to ask a simple question: Why do some people succeed? That question is relevant to military training, of course, but also to a host of other endeavors: business, education, athletics, entertainment, artistry, technical trades, etc. In any field of effort, some people rise to the top. What psychological factors explain their achievement? A common answer is “genius,” which describes a knack or talent for something. We look at child prodigies and think, They will do great things. Success is simply in their nature. Angela Duckworth thinks the “genius” argument is not helpful. When we focus on natural talent, we begin to think that success in a given endeavor is pre-determined. And we overlook other factors that might be in play. Duckworth is a professor of psychology at the University of Pennsylvania and a 2013 recipient of a MacArthur Fellowship—the so-called “genius grant.” Over the years, she has amassed a growing body of research to indicate that “grit” is more important than “genius” when it comes to determining success. Her book explains what grit is and why it matters (Part I), how to grow grit from the inside out (Part II), and how to grow grit from the outside in (Part III). 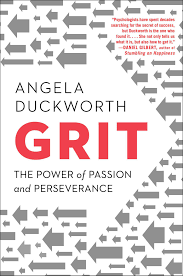 First, the definition: Grit is a “combination of passion and perseverance.” Duckworth writes: “no matter the domain, the highly successful had a kind of ferocious determination that played out in two ways. First, these exemplars were unusually resilient and hardworking. [That’s perseverance.] Second, they knew in a very, very deep way what it was they wanted. [That’s passion.] They not only had determination, they had direction” (emphasis in original). Duckworth describes each of these assets using both anecdotes and data, and she offers practical advice for how to develop these assets personally. The third section of Grit shows how passion and perseverance can be instilled in us through the example and advice of others. Here, Duckworth focuses on the roles that parents, teachers, extracurricular activities, and culture—corporate or team culture, not national culture—can play in growing gritty individuals. There’s sound, practical advice for leaders in these chapters. As a parent, I was particularly drawn to her advocacy of “wise parenting,” which strives to create an environment for children that is both supportive (“I love you”) and demanding (“You can do better”). Although Grit examines the psychology of achievement from a secular point of view, I cannot help but think, as a minister, that it can shine some light on the ministries of the local church too. In the Pentecostal tradition, we often look for “calling” and “giftedness,” which are the spiritual analogs to “genius” and “talent.” There’s nothing wrong with this, of course, because God does call and gift people for ministry, whether ordained or lay. The problem is, too often, we only look at those elements. So, we hire the charismatic preacher or the enthusiastic youth pastor or the worship pastor who’s a musical prodigy and are surprised when they crash and burn. Worse, we overlook the less-charismatic preacher or the slow-and-steady youth pastor or the worship pastor who has to work hard to get the song service ready because their “calling” and “giftedness” are less obvious at first glance. Perhaps what we need is a more thorough way of examining grittiness in ministerial candidates, of their passion for and perseverance in ministry over time. The slow burn is far stronger than a flash in the pan. I thoroughly enjoyed and highly recommend Grit, whatever your context. As a husband, parent, minister, and PhD student, the book kept shining light on areas where I can cultivate greater passion and perseverance regarding long-term goals, and in the process, experience better results. I think you’ll find the book similarly illuminating. 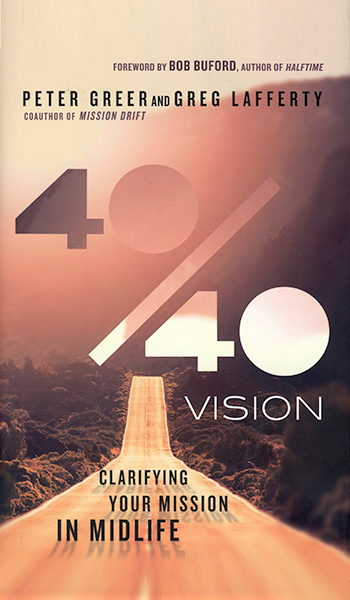 Peter Greer and Greg Lafferty, 40/40 Vision: Clarifying Your Mission in Midlife (Downers Grove, IL: IVP Books, 2015). An 80-country survey asked respondents, “All things considered, how satisfied are you with your life as a whole these days?” People in their 40s were least satisfied, with 46-year-olds being unhappiest. I am 46 years old. Needless to say, I read Peter Greer and Greg Lafferty’s new book with keen interest. The forties are the decade when men and women experience midlife crisis. They are halfway through their lives equidistant from the start of their professions and their retirement. The twenties and thirties are predominated by questions of success. In the forties, however, questions of significance take the lead. According to Greer and Lafferty, the kinds of questions 40-year-olds ask are these: “All this work, does it even matter? I’ve striven for so long, but I’m still not there—and now I’m losing interest. Why am I not happier? Is this my lot in life? Did I miss my calling? Is it too late for a do-over? Was all that I pursued in my thirties a mistake?” (emphasis in the original). These are questions of meaning. To navigate the turbulence of the forties is thus to navigate the waters of life’s meaning. And few books of the Bible address the question of meaning more acutely than Ecclesiastes. But wait, you’re thinking to yourself; doesn’t Ecclesiastes say that life is meaningless? “‘Meaningless! Meaningless!’ says the Teacher. ‘Utterly meaningless! Everything is meaningless’” (1:2). If you’re having a midlife crisis, that’s hardly the kind of statement to cheer you up. 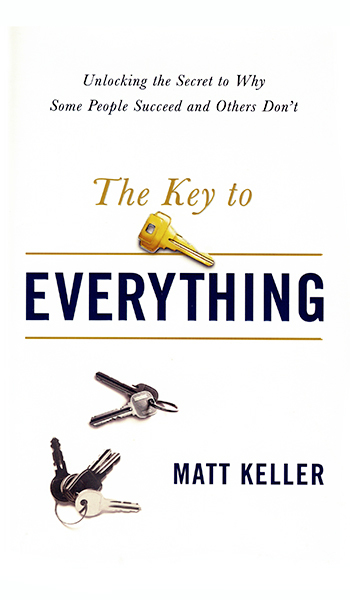 True, but as Greer and Lafferty point out, Ecclesiastes’ perspective is that of a “functional deist,” that is, “a person who acknowledges God’s existence but suffers due to his apparent absence.” Such a person can experience great success and pleasure in life, and yet still discover that they don’t guarantee a meaningful life. What is needed is a larger worldview, an above-the-sun perspective. But notice the parentheses in the chapter title; they are important. A person focused on getting is uncharitable. But place that negative prefix un- in parenthesis—qualify or limit it—and you discover that wealth isn’t the problem. It’s the lack of generosity. The authors write, “In the United States, we’ve developed super-sized appetites for pleasure, but we haven’t experienced a corresponding rise in our taste for giving.” Accumulating money doesn’t make you happy or filled with a sense of meaning. Being generous with what you have does, however. The same can be said for all the goods we pursue in life. They’re not necessarily bad in and of themselves, but they’re unalloyed goods either. A meaningful life recognizes their limited, qualified, under-the-sun goodness. Precisely because I’m in my forties, I paid close attention to the advice given in 40/40 Vision, and I recommend it highly, especially if you’re in midlife too. I want my next forty years to be even better than my first forty. I especially recommend reading the book to forty-something pastors. It’s hard enough to lead a congregation under normal circumstances, let alone on top of a midlife crisis. Get help early and often! At the start of this review, I noted that 46 years of age was the low point of unhappiness in that global survey. If that’s where you are today, you don’t have to get stuck there! For, to borrow a phrase from Ecclesiastes, God will make everything beautiful in its time (3:11).